Peyton Manning is having a career year for the 11-3 Broncos. 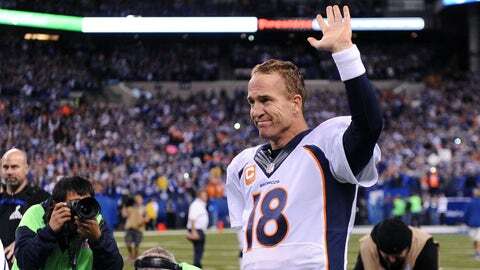 Peyton Manning has been named Sports Illustrated’s "Sportsman of the Year," making him the eighth NFL figure to win the award in the 60 years of its existence. Peter King made the announcement during halftime of Sunday night’s Bengals-Steelers game. While Manning is having a great year — he needs just four more TD passes to break Tom Brady’s record of 50 TD passes in a season — he seemed like a surprise pick for the award. King mentioned that former Yankees closer Mariano Rivera and Red Sox star David Ortiz were also up for the award. Ortiz seemed to be the logical choice considering that he helped lead the Red Sox to the World Series title in October and how he helped inspire the city after the Boston Marathon bombing. David Ortiz and/or Mariano Rivera would have been much more deserving choices for SI award. Quite a few others. Silly to care about such things but this seemed like a great year to award David Ortiz with Sportsman of the Year. Mariano Rivera & David Ortiz had career seasons on & off field. Petyton Manning sold pizzas… & apparently magazines. Sportsman of Year? Manning has the Broncos in position to be the AFC’s top seed in the playoffs. Last year the Broncos lost their only playoff game at home against the Ravens.